When a baby is on her way, everybody wants to celebrate. That’s how the tradition of a baby shower is born! 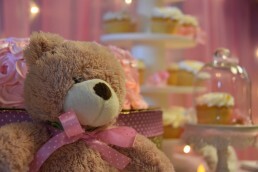 A baby shower is usually a tea housed in the house of the future mom or at her best friend’s. It is therefore informal and intimate, guests open up and give precious advices to the future mom. Usually, it is held at the 8th month of pregnancy. 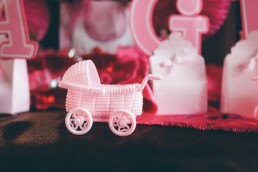 During a baby shower, friends and family offers toys and useful stuff like blankets or the trousseau for the baby. The future mom, on her side, can’t send guests away empty handed! And what’s better than a party favor homaging to the baby? The sweet table at a baby shower is colorful but not too vivid: we are celebrating a baby, so pastel shades are more appropriate. You can choose among many shades of blue or pink, according to the gender of the baby. In our collection you can find many coated almonds that suit a baby shower’s sweet table, such as the stelle sfumate and the sferici –delicious spheres in pastel shades.